Bryan Elementery teacher Rhonda Peña instructs students in the classroom at Bryan Elementary on Friday, Aug. 31, 2018, in Mission. MISSION — Her first day of class began with a lesson in kindness for her fourth- and fifth-graders. She gave them a tube of toothpaste, told them to squeeze some out, and then asked to put the paste back into the tube. None of them could. It’s been 28 years since Peña, 52, thought she was arriving to the Valley just to gain experience for one day. This year she is not only celebrating 25 years teaching at Bryan Elementary, but also her recent regional Teacher of the Year award and news that she is a finalist for the statewide recognition. The Texas Association of School Administrators selected six finalists for statewide Teacher of the Year recognitions, and Peña is representing the Rio Grande Valley as one of three vying for the elementary teacher award. Next month, Peña and the other finalists — three for elementary teacher of the year and three for secondary teacher — will be interviewed by a TASA panel in Austin. Peña was born and raised in Coleraine, Minn., and in 1990 she made her way to the Valley after filling an application at a job fair in which representatives from the Valley were recruiting. She knew nothing about the area, she said, other than whatever she learned from pamphlets given to her by recruiters. But the fierce competition for few teaching spots back home and her desire to begin her ideal career in teaching was greater than any fear of moving. So she made the nearly 2,000-mile trip away from home. The stay was supposed to be temporary, she said, maybe a year in order to go back home with experience to apply at local districts, but she built a life and a family in the Valley. Her goal was never to move up the ranks and become an administrator, but to remain in the classroom teaching and learning as much as she could to give the students a strong base in their initial school years. From applying for grants to buy her students new algebra tool kits, to creating an algebra club for students and soon a club for their parents, Peña likes to remain in constant evolution. One of her goals is to find new means of engaging her students in a holistic way to keep them growing and developing all of their abilities. It is the notion of the elementary school years as important building blocks of a student’s learning career that has kept her in elementary school so many years, she said, and it is her students’ humor and liveliness that remind her daily of why she loves teaching. 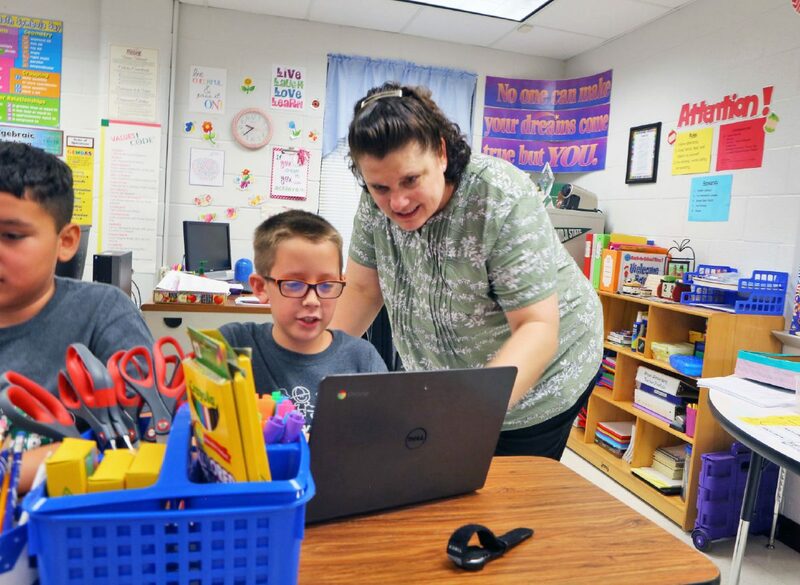 At Bryan Elementary she found a family, she said, which allowed her to do what she loves to do and grow as an educator, something she hopes to pass down to new generations of teachers. Her hope is for this regional award and the possible state recognition to remind her family of teachers the importance of what they do.